Charlie Douglas had two sons, as noted already, Charles and William. Charles (I'm just going to call him Dad) enjoyed holidays to Rothesay as a boy. He worked as an office boy at James Cunningham, coal fitters, in Glasgow and then in Rolls Royce. When the war came he took the opportunity to join up and have an adventure. Also, he knew that if he joined up first he would have some say in which service he would enter. He wanted to join the RAF, because he didn't fancy the marches infantry had to make. Perhaps he did not realise that the BEF was fully mechanised. Dad was not recommended for aircrew, he thinks this is because his Maths was not good enough. Presumably this reflected a weakness at trigonmetry. Given the high mortality rate for aircrew this may have saved his life. When he was doing his basic training in England Dad linked together two news items in his mind and proved to be correct: reports from Germany that Hitler's deputy leader, Rudolph Hess, had gone missing and reports from home of a single plane flying over Eaglesham, where Dad had often visited his gran and other relatives. It turned out that Hess had flown to Scotland hoping to meet the Duke of Hamilton (Douglas Douglas-Hamilton) whom he knew slightly as both were fliers to negotiate a Western Front peace to allow Germany to attack the USSR. As it happened he could not find his destination and if the duke knew of the plan he had wisely absented himself from Scotland. Hess was detained by a local farmer and spent the remainder of the war in the Tower of London. Dad kept a diary spasmodically on the troopship voyage to India. It was a long journey as the Mediterranean Sea was not considered safe. Technically, he was not allowed to keep a diary but there seem to be endless numbers of people who kept some form of diary in the services. The diary still exists. Dad was posted to a backwater RAF base in what is now Pakistan, RAF Jiwani. He seems to have had a great time and talked at length in our childhood about the good times he had with friends there. Corporal Albert Gething was a room mate and life long friend. I met him and his wife in 1982 at their Stockton home. Albert and Dad "invaded" neutral Iran when swimming a river: by crossing to the far bank they had entered Iran. That was as close as they came to seeing action. Dad was not eligible for the Burma Star as his base was too far from the combat zone. Throughout his time in service Dad was a direction finder wireless operator but in 1945 he applied to learn to fly. This would have meant a posting to flight school in Kenya. He fancied that. Thankfully the war came to an end before he could go on the 6 week course: the survival rate of pilots was very low in Asia at this time compared to the Americans (source Strategy and Tactics magazine). Dad was demobilised and returned to Glasgow where he lived at his parents' home for a time and had a job. He moved to Northern Ireland around 1947 to work at Gilnahirk where there was a wireless station. This was a civilian posting. He was collected from the ferry by cousin Nessie Bennett's connection, Sam Keith, who lived in Waterloo Gardens. Always a reader, Dad bought a newspaper on the boat, the Irish Independent. Mr Keith made a little comment about the choice of paper being a surprise. This was Dad's introduction to Northern Ireland's divided nature. The Keiths were very welcoming, so much so that Dad did not attempt to find more permanent accommodation for himself at first and the Keiths did the work for him. Incidentally, I have a photo of the grave of their maid. Telling my Dad this in 2015 he just remarked, "Yes she was a nice woman, she's buried at Ballylesson. I was at her funeral." So there is a connection of sorts to my own church but he hadn't thought to mention it. At first he was in what his generation called "digs" on the Antrim Road, later he stayed with a Mrs Lynn on the Beersbridge Road. He had a good relationship with her and they remained in touch for the rest of her life. Fond of travel though he was, Dad had found his niche; he married Mum (who worked at the Enfield Dairies at Ballyhackamore) in 1952 and they moved to a house close to where Mum's parents lived. It was said that every other house in the area contained someone who worked at "the station." After my sister was born Dad began a 3 year placement to Singapore. They sailed out on 29th April 1955 on the SS Corfu, bound for Hong Kong first (Ancestry, UK Outgoing Passenger Lists 1878-1960) and returned in 1958. The family travelled home on the SS Himalaya, arriving on 2nd June 1958. Their stated address was the Cora Hotel, London. The previous port was Lisbon (from Ancestry, UK Incoming Passenger Lists 1878-1960). Going through the Suez Canal meant this was a shorter journey than that in WW2 when the Mediterranean was too dangerous and he sailed around the Cape of Good Hope. He could have uprooted the family on several occasions to Hong Kong or Cheltenham but Dad was conscious of the impact this would have on some of us and we remained in NI, though he did 4 stints in Turkey in the 1960s and 1970s. When the wireless station closed in 1977 Dad chose to stay in N Ireland where he worked in the National Farmer's Union as a clerk and then as a technician at Dundonald Girls' High School until he was able to retire. He wrote a lot of letters to newspapers and magazines, often winning prizes. After retirement he discovered a limited talent for acting through an old colleague who was an 'extra'. Dad appeared in several NI TV programmes as an extra and in the first series of Game of Thrones. When grandad heard the name chosen for my brother he replied quietly, "Welsh, isn't it?" Dad deduced that something was wrong. Thinking it over he added the middle name "Charles". After a career in insurance he now devotes his time to wargaming and holidaying abroad. My sister married and had two children. One lives in Ontario, Canada and the other is a printer. He lives in Millisle, Co Down, with his wife and two children. I read Archaeology at Queen's University, Belfast before becoming a teacher. I am married but have no children. Uncle Bill was born in 1927 at Caldercuilt Road but the family soon moved to the HIgh Street. Dad observed to me recently that when he left to join the RAF Bill was a school boy but when he came back he found his younger brother was a man, with evidence for this in the form of Bill fixing things around the house for his mother. Bill was evacuated early in the war to a place in the Aberdeen area but after the Germans over-ran Norway this was in the range of their bombers so he was moved to Ayrshire. He was turned down for service in 1944 because of his eyesight. By the time he married Aunt Martha in 1954 he was working as an optical instrument maker. Earlier he had worked in a jewellery shop for a family relative and was regarded as having potential. The photo below, from Colin Douglas, shows him with a group of apprentices at his new work. When he met Aunt Martha he was also working in a dance hall and apparently she thought he was a bit sure of himself. Nonetheless he persevered and she saw another side of him, the result being a marriage which lasted for over 60 years. The wedding photo below (family collection) shows them at their Glasgow wedding, with Martha's best friend, May Coogan, as bridesmaid. Bill's friend, Jimmy Scott, was best man. After they married Aunt Jean Borland was able to secure their first home at Marmion Street (the same tenement block as themselves). The tenement block no longer exists, pulled down in the late 1960s or early 1970s. I have another picture, an informal one showing the party leaving the registry office, from Colin Douglas. Bill moved to "digs" in Hertfordshire around 1961 and when established at a job in the new town of Stevenage brought his family to join him. Here there was a garden, there were parks and the old attitudes of Glasgow could be forgotten even if the accents still remained. Dad in RAF uniform around 1943 (family collection). Note the top button undone. Dad's uniform had to be returned to th RAF when he was demobilised. Below is part of Dad's RAF record. I found these among his documents recently. He was described as being of excellent character. The nearest RAF recruiting office was in Edinburgh, I understand. Reading Charlie's wartime diary (right) I was surprised to read references to submarine activity. I thought these were likely to be false alarms but this was not the case. www.fad.co.za/Resources/contribs/bizley leads to an interesting article by Bill Bizley. From this we learn that there were 155 ships sunk during the war off South Africa. Even more surprisingly, the Japanese navy crossed the Indian Ocean in May-July 1942 attempting to prevent Allied occupation of Madagascar. As a result of their activity off Natal a black-out was introduced. Four U-boats were active between the end of October 1942 and early December 1943. The next phase, the one Charlie was part of, began in late Feb 1943 with U 160, U 506, U 509 and U 516. This ended on 14th March when their refuelling vessel was summoned home but had led to the loss of 7 ships off Natal. In April 1943 an Italian submarine sank three vessels south east of Durban. By the time Charlie was sailing around the Cape there were Catalina squadrons based at Durban and St Lucia. Mary Bennett at her 100th birthday party in Stevenage, Herts, with two sons, five grandchildren, three great grandchildren and other relatives. I'm happy to put up names for those adults who are happy to be named. Dad wrote a diary between Friday 15th January 1943, the day he left Glasgow following home leave, and Saturday 17th April 1943 when he was on the troopship, Duchess of Richmond, en route to India. Sunday 17th January "Left Wilmslow by special train to Liverpool... overhead train to Gladstone Dock...200 of us in a messroom on "D" deck. It's a bit cramped. I am sleeping on the floor with lifejacket as pillow." There was no immediate move as he complained two days later that they were still there but Dad was making more friends: "Met Joe Hamilton from Petershill Rd and a fellow from Edgefauld Rd. He knows Dougie Gaston and Peter Waldie and some of the fellows I was at school with." After all those days travelling by train and waiting: Thursday 21st January: "Awoke to find a familiar smell in the air. Rushed up on deck to find us in Clyde sailing past Arran. Anchored off Dunoon. Spent most of the day on deck looking at places I know too well. K..., Dunoon, Gourock and Helensburgh. Beautiful moonlight. Had an argument with some Englishmen." There were 5 more words which were scored through following this. There they stayed for a few more days, at first he wanted to get on with the journey but later he agonised that he could not go to Glasgow for a visit- no one was leaving the ship. However, he reported news that Tripoli had been captured by the Eighth Army. Having left the Clyde for the Atlantic the order came to fasten everything down once they passed Islay. Monday 25th January: "Our 20,000 tons is being tossed about like a cork. Just our luck to sail the Atlantic in January. Nearly everybody sick, including me. I wish we were flying." By Tuesday he noted "The table goes from side to side and everything that can move does. Have given up any ideas of joining the Merchant Navy." Whether this was a joke or not it is hard to know. He never mentioned such an idea later to his family. Certainly, the Bennett family were of a sea-faring and building tradition as his grandfather William Bennett had sailed on SS Valletta to China and Japan and his second (?) cousin John Bennett was in the Merchant Navy (though whether Dad ever met him or knew of him is less certain). On the 28th January he was in very good form, largely related to food. This can be no surprise to his family: "Feeling champion. Eating as normal. 1/2 doz bottles lemonade and the usual. Good dinner today. Best soup I ever tasted in the RAF. Prunes and custard also A1. Very nice chop and potatoes. Yes sir, I feel myself again." On the 30th he noted that he had applied for an aircraft recognition course to pass the time and details of a classical music concert [by gramophone]. Dad had a lifelong appreciation of classical music. Personnel were strictly forbidden from keeping diaries in case they fell into enemy hands. For instance, "...aircraft carrier, 7 ships and 4 destroyers left us in the afternoon (probably for Gibraltar) is exactly the sort of thing they would have found useful. Sadly for us, two pages of the diary is missing and we do not know when exactly this occurred." The convoy landed at Freetown in Sierra Leone. In his 90s and suffering dementia Dad still remembers the black water of the river there and the lights shining at night- no restrictions there. They then docked at Cape Town and encamped near the town on 22nd February. Dad seems to have had a good time going to various clubs with friends but described one day, which he still remembers, when he and a friend had to march 4 miles back to camp in a torrential shower. He wrote at the time that they felt like they were in a river. They had left the Duchess of Richmond behind and now sailed on a ship half that size, the Dilwara, on 14th March. Dad has travelled to many countries since then but never returned to South Africa. He had written about liking to return when not bound by rules and regulations. 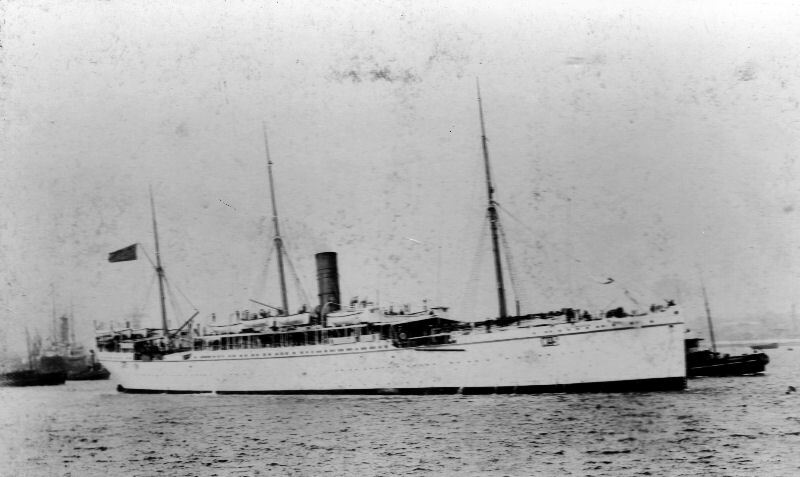 Below: SS Dilwara, from Roll-of-Honour.com, with thanks. The website cites that the ship had been built on Clydeside by Barclay Curle and Company and launched in 1935. She had been purpose-built as a troopship and indeed features in a Pathe newsreel from the Suez Crisis of 1956, showing soldiers embarking for there. On 19th March he wrote, "Destroyers dropped depth charges today. We have gone an awful way off course owing to submarines." and on 26th March he wrote of "one of the remaining cruisers has taken up zig-zagging ahead of the convoy." Were there really German submarines operating off the coast of South Africa? Apparently so.